These are just some of the ways we strive to reduce our environmental footprint and show our commitment to the earth. We are building a sustainable future so that we can continue to celebrate with the people of Ajax and surrounding areas for years to come. Our philosophy is that today’s best companies are thinking about tomorrow. The only thing more important to us than taking care of our customer’s goods is taking care of the environment that we all share. By investing now in energy efficiency and other eco-footprint reducing initiatives, we are ensuring our ability to provide clean and safe storage. This Valentine’s Day, show some love for the planet and look at what you can do to join us in our commitment to creating a greener future. Buy your sweetheart a potted plant that will brighten up your home all winter instead of the traditional bouquet of flowers, or maybe get creative with a fun DIY gift that is truly one-of-a-kind. However you spend this holiday, don’t forget to show some love for your mother. 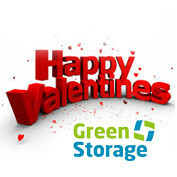 We here at Green Storage Ajax are proud to continue to be the first and most eco-friendly self storage company in North America. The planet is our first love and we hope to keep it as our Valentine.